American Assassin is as generic an espionage thriller as you’re likely to find. Leaving no cliché unturned and offering a roster of predictable “twists” and unsurprising “surprises”, the production seems more like it was assembled from the leftover bits and pieces of better movies (most of them featuring James Bond) than the result of a screenplay written by four Hollywood veterans, one of whom is an Oscar winner. The story is so obvious that a viewer could leave the theater for fifteen minutes and not be even a little lost upon his return. The opening scenes sets up the scenario with remarkable economy. Mitch Rapp (Dylan O’Brien) is on vacation in Spain with his girlfriend, Katrina (Charlotte Vega). He proposes marriage and she accepts. Moments later, she is dead, the victim of a terrorist attack. The time frame skips ahead 18 months. Mitch, having devoted his life to revenge, has infiltrated the cell responsible for his girlfriend’s death. At his first face-to-face meeting with the extremists, as he is about to make his move, the CIA intervenes and usurps Mitch’s revenge, killing the terrorists. He is then offered a job by Irene Kennedy (Sanaa Lathan), the director of one of the agency’s elite covert groups. In order to join, however, he must “pass” the brutal form of basic training presided over by the group’s leader, ex-Navy SEAL and all-around badass Stan Hurley (Michael Keaton). After that, the movie is comprised of standard material involving an ex-agent (Taylor Kitsch) who wants revenge, Iranians trying to get their hands on the components necessary to build a nuclear bomb, a beautiful agent (Shiva Negar) whose personal pain rivals Mitch’s, and a brutal torture scene involving fingernails being ripped out. The movie has a distinct direct-to-video vibe to it but I guess that too many high-profile names were attached for it to be accorded that fate. The mere fact that it has been released theatrically doesn’t make it a better movie. Director Michael Cuesta keeps the tone dark and dour. It’s strange for such a by-the-numbers action film to take itself so seriously. The filmmakers of John Wick and Atomic Blonde recognized that black humor and ostentatious, high-octane action scenes go a long way toward making something like this fun. Neither quality is in evidence, however. The screenplay attempts to say something about the pernicious effects of revenge on the soul, but the message gets muddled. The movie has a chance to redeem itself at the end and, for the briefest of moments, I thought it was going to do something daring…but it chickens out and plays it safe. If there’s a reason to see this movie, it’s Michael Keaton, who invests his portrayal of Hurley with a callous, no-nonsense attitude that makes him interesting. Keaton has energy – something sorely lacking from the rest of the cast. The lead, The Maze Runner’s Dylan O’Brian is trapped in a permanent funk. Not only does he lack charisma but he mopes around so much it’s hard to root for him. Taylor Kitsch’s villain, who goes by the codename of “Ghost”, is an entitled whiner who’s peeved that Hurley didn’t fill his Daddy void. We’ve seen this character countless times before and Kitsch doesn’t bring anything to the part to distinguish him from his numerous predecessors. There’s not much more to say about American Assassin. It’s a soulless example of a product assembled and packaged for those who crave an “old-fashioned” no-frills action movie. The film is made with sufficient competence not to be embarrassing but, while this isn’t a bottom-feeder, there are better options out there for aficionados of the genre. 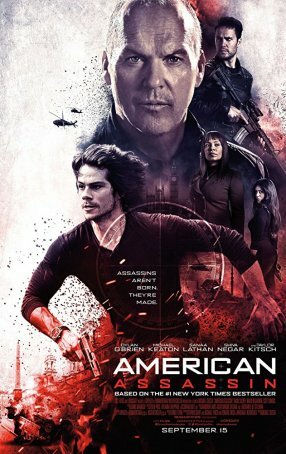 American Assassin kills time but accomplishes little else.